Kingston was a beautiful, stout racehorse that frequently ran two mile races two days in a row. He was most influential through his daughters, dams of classic winners in England and the U.S., and several of his sons had an impact on bloodstock breeding in Australia. Kingston's sire was the small, sound stayer Venison, twice leading sire in Great Britain, and universally admired for his blood-like qualities and courage. He stood at Stockbridge, Hampshire throughout his career as a stallion. Kingston's dam, Queen Anne, was by the good stayer Slane (1833), the latter second twice in the Ascot Gold Cup and winner of a number of cups, plates and stakes over two miles and more. Queen Anne (1843) had speed, and won the July Stakes at Newmarket as a juvenile for her owner-breeder, Colonel Jonathan Peel, whose horses -- including The Nabob (sire of Vermout), Orlando, and Slane -- were bred at Hampton Court and at his stud at Twickenham, Middlesex. Queen Anne's first foal was Kingston, born in 1849. She dropped her second, a filly named Bounty (by Bay Middleton or Alarm), the following year; she had no produce after Bounty. Kingston inherited Venison's soundess and the staying ability of both Venison and Slane, winning 17 of his 43 starts between the ages of two and five (unplaced 9 times), almost always running in the highest company against classic winners and other great handicap horses. Turf commentators were in consensus regarding his looks -- he was considered one of the most beautiful animals ever to set foot on the turf, with a coat shot through with silver hairs (gratis of Venison), leading The Druid to call him the "beautiful Knight of the Silver-hair." His first trainer was Harry (Henry) Stebbings, and he was most frequently ridden by the Basham brothers, Nat and Bob, although Flatman, Marson, and A. Day also jockeyed him, and all, according to The Druid, were "fond of him, and Job Marson used to say that he was 'quite an armchair." Kingston was high-spirited, another Venison trait, a "...gay heart who used to come dancing, Bay Middleton fashion, into the enclosure..." and when he was three, rumors circulated that he was a man-eater, no doubt fueled by the tempers displayed by Venison sons Cariboo and Vatican (1846), the latter also in Stebbings hands when a stallion and suffering for it. But he was, in fact, a docile racehorse and stallion, who would walk quietly "as a lamb" beside his lad after exercise, "with his head almost resting on the lad's shoulder." Like several other notable horses, Kingston had a cat that kept him company in the stable. Peel's stable was dispersed in August of 1851, and Kingston, who had run in Peel's name in his first two races, was purchased by Lord Ribblesdale, along with his yearling half-sister, Bounty. Ribblesdale ran Kingston twice more as a juvenile and twice at age three before selling him to J. B. "Jolly" Morris early in Kingston's three-year-old season. Morris, born in Ireland, was a successful bookmaker, considered more honest than most of his brethren, and had purchased his first racehorse, Hungerford, before he ran unsuccessfully in the 1851 Epsom Derby. Kingston and the Venison son Vatican, which he purchased in 1850, were his best runners, although he won the 1854 Doncaster St. Leger with Knight of St. George (with Bob Bashum up). At age two Kingston debuted in Ascot's New Stakes, finishing third to Hobbie Noble and Grey Tommy. That same month, June, he dead-heated twice with Chief Baron in the Triennial at Stockbridge, and then divided the stakes, with Chief Baron taking the walk-over. Running for Lord Ribblesdale in the fall, he won Newmarket's Hopeful Stakes, and in October at Newmarket took the Clearwell Stakes. This early precocious speed would later be seen in a number of his offspring. At age three he won six of his nine starts, and placed second once. His first race was the Epsom Derby, where he ran unplaced (won by Daniel O'Rourke, with Stockwell also unplaced). At Stockbridge he took the second year of the Triennial over 1-1/2 miles, after which he was sold to Morris. He went on to Goodwood, winning the 2-1/2 mile Goodwood Cup, beating Little Harry and 1851 Derby winner Teddington, and a big field, and a few days later he took a walk-over for a sweepstakes. At York August he won a Queen's Plate over 2 miles. He was taken to Doncaster, where Stebbings said he was never so fit; he had successfully run a trial against the year-older Hungerford, giving him 7 pounds before the Doncaster Cup, and hopes were high, but he failed by a neck against Teddington. He went on to win a sweepstakes over 1-1/2 miles at Eglinton. His last race of the year was the 2 mile-2 furlong Cesarewitch, the day after he won a race for £50; he was unplaced in that race, won by Weathergage. At age four he ran ten races, winning three and placing second or third four times. He was unplaced in the Great Northamptonshire Stakes (2 miles, won by Defiance), and the next day won the Delapre Stakes over a mile. At Ascot he ran third, but unplaced in the 2-1/2 Emperor of Russia's Plate (Ascot Gold Cup) to Teddington and Stockwell. Two weeks later, at Stockbridge, he won the third year of the Triennial over 2-1/2 miles. A week after that he was at Newcastle-upon-Tyne, where he won the 2 mile Northumberland Plate, and the next day ran second in the 2 mile Gold Cup Stakes. In July he was back at Goodwood, where he was unplaced in the Goodwood Stakes, but the next day ran second to the French filly Jouvence in the Goodwood Cup. At York August he could only run third in the two mile Queen's Plate, but back at Newmarket in October, Morris challenged for the Whip, a race run over the Beacon Course, slightly over four miles in distance, and Kingston took it, beating Teddington by six lengths. He had a very heavy last season at age five, Morris counting on Kingston's gameness to carry him through a lot of back-to-back races. He won six of his twenty starts that season, was second five times, and third five times. At York April he ran unplaced in the Great Northern Handicap (2 miles), won by Virago, who would win the One Thousand Guineas and a number of good handicaps that year. At Epsom, he was third to Defiance and Lascelles in a great finish in the 1-1/4 mile Craven Stakes, where he "defeated himself by trying to make a pace." The next day he won the 1-/1/2 mile Epsom Cup with a change of tactics, beating by a neck the year-younger Rataplan and giving him weight, and several other horses. At Ascot he was third in the 2-1/2 miles Ascot Stakes , won by the sturdy Little Harry, and two days later, in the Ascot Gold Cup, ran second to West Australian by a heart-breaking head, with Rataplan third. A week later he was at Newcastle-upon-Tyne where he was second to Grapeshot in the two mile Northumberland Plate, but the next day he won the Gold Cup Stakes over the same course. Next was Liverpool July, where he ran third in the two mile Liverpool Cup (won by Ammonia, by the Venison son The Ugly Buck) and the same day was third again in the two mile Queen's Plate. The next day he was third again in the one mile Licensed Victuallers' Handicap. At York August he was unplaced in both the Great Ebor Handicap and the 100 sovereign County Plate. A week later he was at Lincoln, where he failed to place in the Lincolnshire Handicap Stakes (2 miles), but won the Queen's Plate over two miles the next day. Four days later he was at Warwick, where he won the Queen's Plate over two miles, and was second to Virago (7 st-3 lb) in the three mile Warwick Cup, carrying 9 st.-8 lb. Two days after that, he was at Lichfield, winning the two mile Queen's Plate, and a week later was at Doncaster. There he won the Queen's Plate over 2-1/2 miles, and was second (9 st-5 lb) to that grand race mare, Virago (7 st-4 lb), in the 2-1/2 mile Doncaster Cup, held the next day. At Newmarket Morris again challenged for the Whip, and Kingston ran against Stockwell this year, but his punishing season finally caught up with him, and he broke down during the running -- "both fetlocks touched the ground after his whip breakdown, and one of his legs filled as well." Morris sold Kingston to William Blenkiron, whose offer, at £3,000 was £500 more than that proffered by Sir Tatton Sykes. Blenkiron, a Yorkshire businessman who had made a fortune in his London hosiery and haberdashery business, established the Middle Park Stud at Eltham; in the mid-nineteenth century he secured, through lease or purchase, many famous horses to stand at his stud (Gladiateur, Orlando, Beadsman, etc. ), and a number of foals that became notable race horses (Hermit, Royal Hampton, etc.) were bred there. In 1859, when Kingston's first crop were three-year-olds, American interests offered Blenkiron £5,300 for Kingston, but were turned down. Unfortunately for Blenkiron, Kingston died unexpectedly two years later, on February 20, 1861, just before his seventh season began. "An oak tree shades him," said The Druid, "and a harvest has waved over the spot where that beautiful Knight of the Silver-hair lies buried." Turf commentators bemoaned Kingston's early death, particularly because "he had just begun to hit" with his mares, with his Derby winner CARACTACUS born in 1859, his Oaks winner, QUEEN BERTHA and the good juvenile BLUE MANTLE born in 1860, and the excellent stayer ELY born in 1861, the year he died. These four were his best runners, by far, although he got some other good winners. He got more fillies than colts, and they ultimately proved much more successful in the breeding shed than his sons. Many of his offspring were good juveniles and most, whether they could stay or not, had good speed. Kingston was several times in the top ten of leading sires in England, and posthumously reached second, behind his old adversary, Stockwell ("the Emperor of stallions") in 1862, with winners of 52 races worth £16.648. This was the year CARACTACUS won the Derby and BLUE MANTLE was winning his juvenile races, and fourth in 1863, when QUEEN BERTHA won the Oaks and other races, and ELY was racking up his juvenile wins. As might be expected, he got stayers that won such races as the Ascot Gold Cup and the Cesarewitch, but he also bred a Coronation Stakes winner (8 furlongs) and a Royal Hunt Cup winner (7 furlongs), both showing "extraordinary speed." Most were "mid-sized," well under 16 hands, like him, and some, such as Ely, had his silver-frosted livery. Several Kingston sons were exported to Australia, one of which, also named KINGSTON (1860), had a significant influence on Australian thoroughbreds, and was, in fact, Kingston's most successful sire son. Two Kingston daughters, and possibly a son, had an important impact on U.S. bloodstock breeding. Caractacus CARACTACUS (1859), a bay with a stocking "grey as a badger," bred at Middle Park Stud, had a docile temperament and the beautiful action and game quality of his grandsire, and could go a distance. He was similarly bred to many offspring by his grandsire, Venison, being out of a Defence mare, Defenceless, that ran once and came in last in a two year old stakes at Winchester. He stood 15. 1 hands, and was similar in appearance to Kingston, with an excellent shoulder, good legs and feet, and a bit light in the flanks. Like Kingston, he had a good temperament. He was sold as a yearling to Mr. Snewing, a veterinary surgeon from Rugby. In 1862 he was just behind the year-end champion The Marquis (by Stockwell) in race earnings with £7,575. CARACTACUS started twice -- at Harpenden and at Oxford -- as a juvenile for his owner, Mr. Snewing, and failed to place both times. He placed second by a head in his first race at three, the Great Metropolitan at Epsom in a big field of mostly older horses. He was second again at Newmarket Craven in the Biennial Stakes (won by Duke Rollo) and third in York's Great Northern Handicap to Ivanhoff (age 4) and The Wizard (age 5). At Bath he won the Somersetshire Stakes, beating 12 others. Next up was the Epsom Derby--he wasn't expected to win, and his owner stayed at home, but he did win very easily, beating a big field that included the Guineas (and later St. Leger) winner The Marquis, future Great Yorkshire Stakes winner Zetland, Liverpool July Cup winner The Knave, and a big field. This was his last race. CARACTACUS, who took Kingston's place at Middle Park Stud, and then later based at Snewing's Holywell Farm near Watford, was not a particularly successful stallion. He was sold to Russia after the 1872 season. His winners included Captivator (1867, Miss Hawthorn - King Tom), winner of the 2-1/4 mile Great Metrpolitan Handicap at Epsom in 1871; Captivator and another Caractacus son, Cassivelaunus (1869, from Campanile-Stockwell) both went to Australia, with the latter going on to New Zealand in the mid 1870s. In Australia Captivator got some good running fillies that could cover a distance of ground and bred on. A Caractacus daughter, Etiquette (1872, Elegance-Newcourt), also went to Australia, where her tail-female descendants did well. Other CARACTACUS winners included Free Trade (1867, Traffic-Wild Dayrell), winner of the Liverpool Spring Cup, and two fillies that did well in Ireland --Finesse (1866), who took the 4 mile Royal Whip at the Curragh in 1870, and Trickstress (1869), winner of the Irish Derby in 1872. The latter's tail-female line bred on with some high-class broodmares descending from her. Various other CARACTACUS daughters also bred on, with somewhat distant descendants periodically popping up as stakes winners in various countries. ELY (1861), from The Bloomer, a Melbourne mare, was a handsome colt with some silver hairs, and a terrific stayer with a good turn of speed. He was purchased by Welshman William S. Cartwright, who had a stud farm near Wroughton, Wiltshire. He sent Ely to Fairwater Stables, owned by the local trainer, Tom Olliver, who had won the Grand National as a jockey three times in the previous decades. 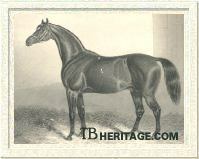 Cartwright later owned 1874 Derby winner George Frederick. Ely did very well as a juvenile, winning Doncaster's Champagne Stakes in a canter, the Triennial at Newmarket, and a sweepstakes at Newmarket Houghton in six starts. At age three his wins included the Prince of Wales's Stakes at Ascot by two lengths, the Biennial at Stockbridge, beating Cambuscan and other good ones, the Bickerstaffe Stakes at Liverpool, the Doncaster Stakes, and the Grand Duke Michael Stakes at Newmarket, plus a walk-over at Liverpool, and a sweepstakes at York. At age four he won the 2-1/2 mile Bath Gold Cup, a big sweep stakes at Ascot and the Ascot Gold Cup, in the latter beating a high-class field, the Goodwood Cup, beating Cambuscan and other high class runners, the Brighton Cup, beating the grand mare Caller-Ou (age eight), Stockton's Claret Stakes, and the York Cup and Burgundy Stakes at York, where he took a walk-over. ELY was an authentic, high-class stayer, yet, like Caractacus, he did not suceed in the breeding shed, despite starting at stud at Hampton Court where he saw some good mares. Ely got Baber (1870), in-bred to Venison, from the good running Newminster mare Beeswing, who was sold as a foal with Beeswing to the Kisber Stud at Komárom in Austria-Hungary. Baber won the 2400 meter Magyar Kanca dig and the 2800 meter Magyar St. Leger, both at Budapest in Hungary, and later produced Buzgo (1882), winner of Magyar St Leger, and the Oesterreichisches Derby (2200 meters) and Austria Trial Stakes in 1885. In France, ELY was dam's sire, through daughter Ella, of Escogriffe (1881 by Caterer), winner of Prix Kergorly (3000 meters) in 1884 and his half-brother Extra (1882 by Trocadero), winner of Prix de Longchamp (Prix Hocquart, 2500 meters) and the Prix Daru at Longchamp (2000 meters) in 1885. An unnamed ELY daughter produced Leopold de Rothschild's Fashion (1877, by Favonius), a very good race mare that won the 2-1/4 mile Chester Cup in 1880 in "the easiest of canters" by three lengths, beating a good field. 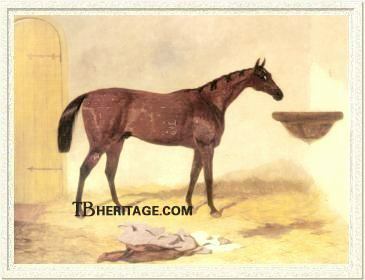 Ely's daughter Lady Inglis was the dam of Antoinette (1874, by Victorious), winner of the 1881 Irish Grand National. Kingston's son BLUE MANTLE (1860, was bred by Colonel Pearson at his Biggleswade Stud in Bedfordshire from the excellent producer Paradigm, by Paragone. Paradigm was second by a head to Lord of the Isles in Goodwood's Lavant Stakes, but broke down several days later and was retired to stud. Her first foals were KING-AT-ARMS (1856) and MAN-AT-ARMS (1857), and PANOPLY (1859) all by Kingston. After BLUE MANTLE, she dropped the good filly Gardevisure (1862, by Vedette). She was then bred to "the Emperor," Stockwell, and to him produced two really high-class runners, Lord Lyon (1863) --a good winner and important stallion-- and Achievement (1864), that won eleven of her thirteen races at age two, and at age three took the One Thousand Guineas and was second to Hippia in the Oaks. BLUE MANTLE was the best of the Kingston-Paradigm foals, described as "as bloodlike a nag that was ever saddled," but "faint-hearted." Purchased and raced by Captain D. Lane, he was a fast, good juvenile, and third in earnings by two year olds at the end of the season, but he never could get a distance, unlike his sire, and while he placed in decent company in later years (third in the Cleveland Handicap and the Essex Stakes, for example) and won Epsom's Four Year Old Stakes by three lengths at age four, he could not win over a mile. But, at age two he did very well, winning the first year of the Ascot Biennial, the first year of the Ascot Triennial, the Ascot New Stakes, and Newmarket's Rutland Stakes, beating big fields, and dead-heating for second place in the Chesterfield Stakes with Lady Augusta (won by Saccharometer), with Actaeon and Dollar unplaced in a field of twelve. BLUE MANTLE'S speed, looks and pedigree attracted the attention of U.S. interests, and he was purchased in 1881, after a number of years of pretty much unsuccessful stud duty in at Rawcliffe Paddocks in York, for not much money, by the American Horse Exchange, and entered James Keene's New York stud where he got just two crops before dying in February of 1883. In England he left Blue Ruin (1874, from Raffle by Alarm), who is of interest because he was the first of the two covering sires (the second, and generally accepted one was Tomahawk) that got Cinderella, the imported dam of Hastings, later the sire of Fair Play. In the U.S. BLUE MANTLE got some good broodmare daughters, including Alta Blue (1883, Alta Vela-Vandal), dam of the 1893 Latonia Oaks winner Dare Vela, and several other winners. BLUE MANTLE'S older brothers, MAN-AT-ARMS and KING-AT-ARMS, won a number of races at shorter distances; like Blue Mantle, they were not stayers. KING-AT-ARMS' big win was the 7 furlong Royal Hunt Cup at Ascot in 1859. He was later sent to stud in Mauritius. Their sister, PANOPLY bred a really good stayer in Pageant (1871, by Elland), winner of the 2-1/4 mile Chester Cup in both 1877 and 1878, and of the Doncaster Cup in 1878. Other winning Kingston sons included GLADIOLUS (1856, from Achyranthes-Thirsk), winner of the 1 mile-2 furlong Liverpool Spring Cup, later sent to Germany; BEDOUIN (1859), a winner at Ascot, including the Visitor's Plate Handicap for three-year-olds; EARL OF SURREY (1859), who took a 650 sovereign handicap at Surrey at age three, and some lesser winners, including BRIGHTON (1859), KING JOHN (1861), CALIBAN (1858), and KINGSWOOD (1860). None of these or other Kingston sons made much of a mark as stallions in England, however two sons, VAGABOND and KINGSTON, were influential in Australia. Kingston's son, also called KINGSTON (1860, out of England's Beauty by Birdcatcher, also dam of SILVERHAIR, ROSE OF KENT AND NON PAREILLE, all fillies by Kingston, see below), was imported to Australia as a yearling by New South Wales breeder John Lee. He got numerous winners over all distances, including Blue Peter (1869), winner of the 20 furlong VRC Canterbury Plate and the VRC Essendon Stakes (16 furlongs) and VRC St. Leger (14-1/2 furlongs); Kingsborough (1871), winner of eight races, including the AJC Derby and St. Leger, and the Cumberland Stakes, and his brother, Savanaka (1874) that won the AJC Sydney Cup (16 furlongs) and the VRC Australian Cup (18 furlongs). (Australian) Kingston's daughter Adeline (c. 1867) became the taproot of Colonial Family 6, an enormously successful family in the antipodes. Kingston's sons VAGABOND (1861, from Frolic by Touchstone) and CALIBAN (1866), both minor winners in England, also went to Australia, where they got some good runners, and Kingston's grandsons Brigadier (1869, by Kingston's son KING JOHN, who stood at Middle Park Stud), Ashbourne (1874, by Kingston's son NOTTINGHAM), and Fenman (1876, by ELY) also were imported into Australia. Of these, Fenman was probably the most successful, getting some good winners in Queensland, including Yelverton, a winner of the Brisbane Cup over 16 furlongs. One of Kingston's sons, HERCULES (1857, out of Daughter of Toscar by Bay Middleton) was sold to Shumway and Jenkins of Mountain View in Santa Clara County, California, and shipped to the U.S. in 1863. "Certainly the fastest walker I ever threw my leg over," said California-based turf writer Thomas Merry, he was sold at auction when Shumway died and purchased by William Boots, a pioneer thoroughbred breeder in California who had established a thoroughbred farm, Elmwood, in San Jose in 1855. Hercules was the first English stallion imported into the state, and Boots had intended to race him, but he broke his leg playing in a paddock soon after his purchase. A French veterinary surgeon living in San Jose was able to save the leg, and Hercules served as an Elmwood stallion until the age of 19, getting many California winners, but none that left a lasting legacy. Kingston did have an impact on U.S. bloodstock breeding, however, through his grandsons Kingfisher and Glenelg (out of Kingston daughter BABTA, 1858, Alice Lowe, by Defence). Glenelg was shipped in-utero to the U.S. where he was a grand stayer and later sire of some terrific running fillies, including Firenzi and Los Angeles, and of Clara D., dam of Americus. BABTA also produced Afric Queen (by Darebin), dam of the U.S. champion Africander (by Star Ruby). Kingfisher (1867, by Lexington), was out of imported ELTHAM LASS (1859, Maid of Palmyra-Pyrrhus the First), a Kingston daughter that won some races in England; he won the Belmont, and Travers Stakes among other races, and became a superior broodmare sire. Kingston's daughter QUEEN BERTHA (1860, out of Flax, by Derby winner Surplice), won three of her ten starts, including the Epsom Oaks and Ascot's Triennial Stakes, and was second in the Doncaster St. Leger, the Doncaster Cup, and the Ascot Derby. She was a grand producer, breeding the Great Yorkshire Oaks winner Gertrude (later dam of Two Thousand Guineas winner Charibert, a successful sire in France), St. James Palace Stakes and Prince of Wales's Stakes winner Queen's Messenger, dual classic winner Spinaway (later dam of dual classic winner Busybody), and the outstanding race filly Wheel of Fortune, winner of the Epsom and Yorkshire Oaks, the One Thousand Guineas, and seven other races in her eleven starts. She and her daughters established the highly successful 1-w female line that is still producing top-class horses today. Kingston's other good running daughters included the Earl of Coventry's THALESTRIS (1860, out of the grand race mare Virago, by Pyrrhus the First), who beat the colts in the 2 mile-2 furlong Cesarewitch at Newmarket and POLYNESIA (1859, from Omoo-Orlando), winner of the 8 furlong Coronation Stakes at Ascot. POLYNESIA later produced Kennington (1867, by Oxford), winner of the two mile Northumberland Plate at Newcastle, and her daughters continued her family line for several generations. 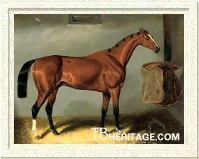 John Bowes' OLD ORANGE GIRL (1860, out of Mowerina-Touchstone) was a consistent winner, taking two races at age two, and at age four winning Stockton's two mile Claret Stakes, and walking over for the Bentinck Memorial Stakes at Goodwood; the latter race was a triennial, and since she had won it in three consecutive years, she received a 481 sovereign bonus. She later produced Reconciliation (1876, by Prince Charlie), a winner of Goodwood's Nassau Stakes over 9 furlongs, and Twine the Plaiden (1873, by Blair Athol), winner of Doncaster's Park Hills Stakes. Two of her daughters established long-lived branches of Family 7-a. Lord William Powlett's PASTE (1858, from Pastrycook-Sweetmeat), was another good staying Kingston daughter; she won the Queen's Plate at Ipswich, and races at Brighton and elsewhere. 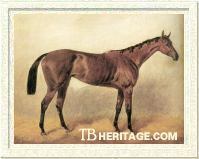 Her tail-female descendants included Epsom Derby winner Hard Ridden, and classic winners in Argentina. Other Kingston daughters that won included AMY (1858, from Desdemona-Iago), winner at age four of two good matches at Newmarket and several handicaps for American Richard Ten Broeck (she died in 1864); ANTIDOTE (1860, out of Aconite-Surplice), who won at Newmarket, Ascot, Epsom, Warwick and other venues over three years on the turf; EAST SHEEN (1858, from Miss Slick-Muley Moloch), a winner at Newmarket, Monmouth and Shrewsbury; and a number of other minor winners. Kingston's significant broodmare daughters included SILVERHAIR (1858, out of England's Beauty by Birdcatcher, also dam of KINGSTON that was sent to Australia), dam of Epsom Derby and Doncaster St. Leger winner Silvio (1874, by Blair Athol) and of Garterly Bell (1872, by Blair Athol). The latter, who inherited his sire's silvery coat, was a good juvenile winner of Ascot's Biennial, Newmarket's Criterion Stakes, and Goodwood's Bentinck Memorial Stakes. SILVERHAIR also bred Tregeagle (1865, by Wild Dayrell), a winner at age two of the Ascot Biennial and Goodwood's Bentinck Memorial Stakes. Tregeagle was sent to the Rapid Bay stud in South Australia, where he got a number of winners and a son, Tubal Cain, that got good winners in Victoria and New Zealand. Silverhair's sister, ROSE OF KENT (1859) was the dam of Lincolnshire Handicap winner Sycee (1864, by Marsyas); Sycee's daughter Mint Sauce became the dam of Doncaster St. Leger winner The Lambkin, of One Thousand Guineas winner Minthe, and of Grand Prix de Paris winner Minting. NON PAREILLE (1861), the third Kingston filly from England's Beauty, also bred on; The top American runner Dr. Fager (1964) was one of her descendants in tail-female. LADY KINGSTON (1856, from Countess-Birdcatcher), in Kingston's first crop of winners, produced Nine Elms (1864, by Stockwell), winner of Epsom's Six Mile Hill Handicap in 1869. MAID OF THE GLEN (1858, Glengowrie-Touchstone) produced Glen Arthur (1874, by Adventurer), winner of the Princes of Wales's Stakes over 13 furlongs at Ascot, and his sister Briony (1878), dam of Great Yorkshire Stakes winner Briardale (1892); Briony's tail-female descendants included Guineas winners Waterloo (1969) and Nearula (1950), and the Australian stallion Todman (1954). FEODOROVNA (1857, out of Empress, by Emilius) produced Padoroshna (1871), a winner of Doncaster's Gimcrack Stakes. At least a half-dozen other Kingston daughters bred on in tail-female, some of which can be seen in pedigrees of horses today.